Commercial Relocation Specialists of Georgia, Inc.sm was formed to provide quality business relocation services to the business sector. Our philosophy is to understand, anticipate and provide outstanding services to meet or exceed our customers needs. 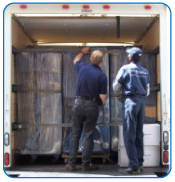 The successful relocation of a business is more than just an experienced crew, it is a combination of expertise and devoted effort that begins with the pre-move planning, the execution of the actual relocation process and ends with the post move services. This allows you, the customer, to minimize your down time and keep your organization’s operation flowing smoothly. Commercial Relocation Specialists of Georgia, Inc.sm takes great pride in the experience and dedication of our entire staff. What that experience and devotion means to you is that you will receive the very best in pre-move planning, move management and relocation services available. We have the resources, experienced personnel and the capacity to meet your demanding schedule and unique needs . By sharing your experience with Commercial Relocation Specialists of Georgia Inc , it will help other customers to make a right choice of using this company.